The Polaris 280 and 360 are, in many respects, the same pool cleaner. They’re built from the same basic design. 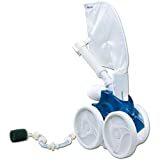 They’re both designed to clean just about any size inground pool in a hurry (often in under three hours), and both are designed to pick up any-sized debris, from a grain of salt to an acorn. The 280 has a slightly wider inlet. The 360, on the other hand, incorporates a belt drive mechanism and three jet nozzles instead of two; this helps to reduce maintenance and repairs and increase its effectiveness in cleaning. Most importantly, the 360 can also operate more readily without a booster pump, reducing the amount of money you have to pay for it up-front. They’re both great pool cleaners, and both will cost you—oh—a bit of money, but we give the nod to the 360 as the better of the two. If your pool is shaded by large trees, you might notice the 280’s slightly wider inlet valve. It’s great for picking up large, fallen leaves. But we think you’ll really notice the difference in performance with the 360’s extra jet nozzle and belt driven drive. Both of those mean faster, more aggressive cleaning that requires less downtime for maintenance. Most people won’t notice the extra leaf litter. They’ll notice the other. Pricing is kind of a tricky thing when it comes to retail shopping. It can change day-to-day depending on who has excess stock they need to move. Both pool cleaners are pretty close to each other in standard pricing and, truth be told, the 280 is normally a touch cheaper. A touch—which means that you’d barely notice it. What you might not notice is that the 280 also requires a booster pump to work, and those run a couple of hundred dollars. So you save a few bucks up-front, only to spend it immediately after, plus more on top of that. The 360’s belt drive mechanism is supposed to cut down on maintenance because moving parts wear out faster and are more expensive to repair. That’s in theory. In reality, if you consider the costs in overall maintenance and upkeep, it’s probably not much more than a drop in the bucket. Both pool cleaners have a reputation for solid performance. Neither has a clear edge. This is just another reminder that with the 360 you don’t need a booster pump. With the 280, you do. That’s significant savings in the up-front cost, which makes it a really great feature of the 360. Of course, it costs a little money to purchase. It also requires a booster pump. You can rationalize the investment as savings in reduced wear on your pool circulation system. Or you can chalk it up to having to pay for excellence. The big selling point for the Polaris 360 is that you don’t need a booster pump to operate it. That’s a novelty for a pressure side pool cleaner, most of which require an additional booster pump for proper operational pressure. Those pumps can cost a few hundred dollars apiece, especially if you need to buy a manufacturer-specific one as the Polaris cleaners require. The 360’s novel design saves you that money. New to the 360 is also a belt drive mechanism. The old 280 uses a shaft mechanism, which means more moving parts. More moving parts means more things to wear down, which generally means more money spent on repairs. The 360 has a belt and, while those also wear out, they’re easier and cheaper to replace. That’s on top of what the 280 design brings to the table, which is fast, thorough cleaning and an ability to walk walls like the human fly. It also comes with the traditional debris bag that enables it to sort out debris before it gets into your cleaner’s main body. That helps spare strain on your pool cleaner’s internal filter. Rather than blow it, however, it’s suggested that you might want to sock it away. The 360 isn’t a cheap pool cleaner, and maintenance and upkeep are pretty expensive. When comparing and contrasting the Polaris 280 and the 360, the 360 is the pretty obvious winner. They’re both excellent pressure side pool cleaners with well-deserved reputations for speed and excellent quality. While the 280 has a slightly wider inlet, we just don’t think that’s enough to account for the advantages to the 360. These include a belt drive mechanism, three jet nozzles instead of two and, of course, the fact that you don’t need a booster pump to use it. That alone will save you a couple of hundred dollars. That’s not to say that the 280 is a bad pool cleaner. Both models are excellent, and both models have the price to back it up. It’s just that the 360 is the superior one.